Currently, I am building an automated wizard that will assist in planning and implementing a peer-to-peer social change campaign. 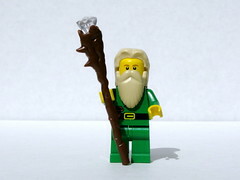 The wizard will recommend platforms to use and best practices for spreading the campaign through social networks. The wizard will also feature an after-action survey covering the tools used and the strategies implemented. This information will feed back into the system that recommends platforms and best practices. If the Social Actions automated wizard helps produce peer-to-peer social change campaigns that compare to the ones that Beth has created in the past year, then I will have accomplished something significant. Peter would like some help with the design. I will. Here's more. Here's one thing. Build in something that helps you map the flow of donations to help analyze your network and campaign. Nancy White has shared some manual examples. It would be nice to have this built into the system in some way. There has already been over $20,000 for the Sharing Foundation's America's Giving Challenge raised through the unselfish giving of over 700 people like Peter Deitz. There is exactly 48 hours left to donate and change a child's life. Contest ends on January 31st at 3:00 PM EST. Hi Beth, Thanks for the write up. I'd love to include a way for individuals to map the flow of donations. I think this is a feature request that we need to bring to the social action platforms. They are the ones who could help trace referrals in an attempt to figure out which community tools (twitter, facebook, flickr, etc) are bringing in the donations and which friends of the campaign helped recruit more friends. I'll raise the question with my contacts at the social action platforms (Change.org, Firstgiving, Changingthepresent, Chipin, etc).